Built in 1896, the Atlanta Stockade was, at the time, the largest city-built penal complex in the State. The compound consists of a prison, a blacksmith shop, stables, and the remains of a third auxiliary building. The prison is also significant in its use of early concrete, including both poured reinforced concrete and cast concrete block. The Stockade is the second prison built on the site, with the original building constructed primarily of wood. The original purpose of the site, when purchased by the city of Atlanta in 1863, was for a cemetery, but plans changed and it was used as a hospital before becoming a prison. The prison is a large Neoclassical and Gothic building constructed in four phases. The 1896 portion was a two-story concrete building with steel-reinforced concrete walls. In 1905, it was enlarged on three sides, including the Classical portico with five columns and four four-story Medieval towers, which served as guard stations. A third-floor room was also added on top of the original prison. In 1910, a three-story addition was added to the northeast side. 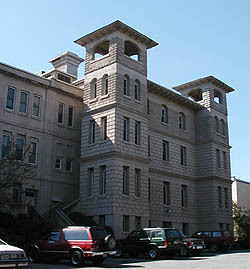 From 1913 to 1916 another three-story dormitory wing was added to the southeast side of the building. Exterior details include alternating textures on the towers and rusticated concrete made to look like stone. Some window and iron bars remain, although no window glass does. The original concrete stairs still exist and interior details include concrete wainscoting and molding in the warden's office. The Stockade was officially closed by the city in 1924. The Girls' High School was built by December of that year on the grounds of the complex. In 1927, the Atlanta Public School system moved their service center into the former prison. This served as a maintenance and repair facility until 1938. From 1938 until 1962, it was used as a furniture warehouse by the school system. After 1962, the stockade was barely utilized until 1987 when it was converted into low-cost apartment housing. The Atlanta Stockade, 760 Glenwood Ave., is currently an apartment building and is not open to the public.